The educational preparation for United Church Diaconal Ministers is rigorous and thorough. Preparation involves scholarly course work in a wide variety of fields, including theology, bible, social analysis, Christian education, church history, and pastoral care; experience in the practice of ministry; and reflection on personal and professional aspects of ministry through a process of integration. Minimally, this preparation requires 4 or 5 years. It is also fun, as the students from Sandy Saulteaux Spiritual Centre demonstrate. 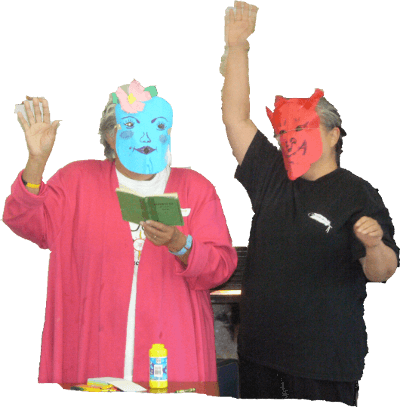 Two educational programs are currently offered for people wishing to become United Church Diaconal Ministers, one at the Centre for Christian Studies, where the majority of Diaconal Ministers are educated, and one at the Sandy Saulteaux Spiritual Centre with a focus on First Nations ministry. See also information on United Church of Canada Candidacy Requirements. Upon occasion, when the circumstances warrant, a special program of preparation has been approved. Ordained United Church ministers wishing to be commissioned to Diaconal Ministry must fulfill the educational requirements. Diaconal ministers from other denominations can transfer into the United Church Order. An assessment of their prior education and experience is conducted and they must meet standards established by the United Church. The Centre for Christian Studies (CCS) collaborates with St. Stephen’s College, in Edmonton and the University of Winnipeg to offer a diploma/degree program leading to either a Bachelor or Master degree in Diaconal Ministry. The practice of diaconal ministry is not limited to those commissioned by the United Church. Many lay people as well as some Ordained ministers understand themselves to also be in diaconal ministry. The educational preparation for this type of diaconal ministry is varied. To see current Community Event offerings check our News Section. The bi-annual National Gathering of DUCC is open to anyone interested in diaconal ministry. It is a combination of education and diaconal formation in community as well as business. Western Field Based Program in Diaconal Ministry, St. Stephen’s College, Edmonton.